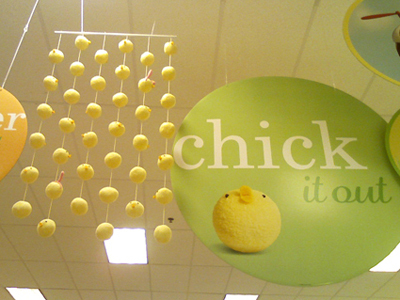 Target has done it again with their Easter theme. This year they used Japanese character Chiyo Chiyo (means Chick Chick). Chiyo Chiyo is a round chick peep with no legs or wings. Just two eyes and a beak. Check out the "curtain" of Chiyo Chiyos. Crazy cute. This round Chiyo Chiyo pillow came home with us. On the Target Chiyo Chiyo website you can send Chiyo Chiyo Easter cards, download an Easter countdown calendar or Chiyo Chiyo wall paper. Oh and order Chiyo Chiyo stuff. Oh my gosh... that is so fun! 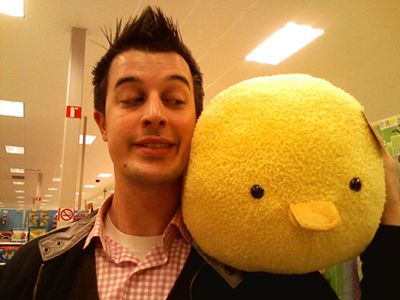 Just downloaded a new, fresh wallpaper from the Target site. Thanks for sharing! Where do you keep all this fun stuff you buy? My husband is already annoyed at all the theme stuff I already have and it is nothing compared to the cute stuff you seem to find! I am still can't get your Mad Scientist theme party out of my head. Now I see these cute chick chick's and have visions of a whole dinner table set up with them. My theme obsession is starting to take over my house. That pillow almost came home with me, too! Your husband is such a good Blog Sport! 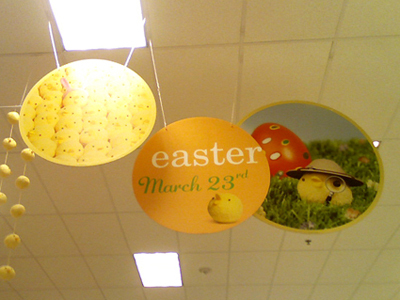 I went to Target twice this weekend and spent way too much time in the Easter aisle. I will also be heading back on the 24th for the sales! I saw that cute Chiyo head, but what I really wanted was a big stuffed lamb. It was $9.99, but I passed the first time. All 3 were gone by Monday. Like Mrs. Spaghetti, I wonder where to put it all. I want the little sets of 3 for the kids' baskets. Must. find. chiyo chiyo! Aww -- domo-kun has a new friend! You must capture them together in film! 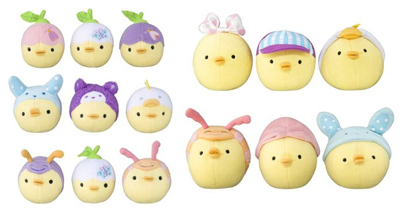 My husband and I were much less informed about Chiyo and just thought they were odd duck heads in a variety of sizes. Somehow, now that you've blogged about them, they're much cuter! i guess they were sold out where i live b/c they are so incredibly cute. I went to 2 different target's and on my second trip i got the chiyo chiyo plush (the last one!) I jumped over a lady to grab him, lol and the lamb was there too (i love them and so does my little girl) thanks for posting! I keep my holiday stuff in the attic in big rubbermaid containers. I didn't see the lamb! Drat!